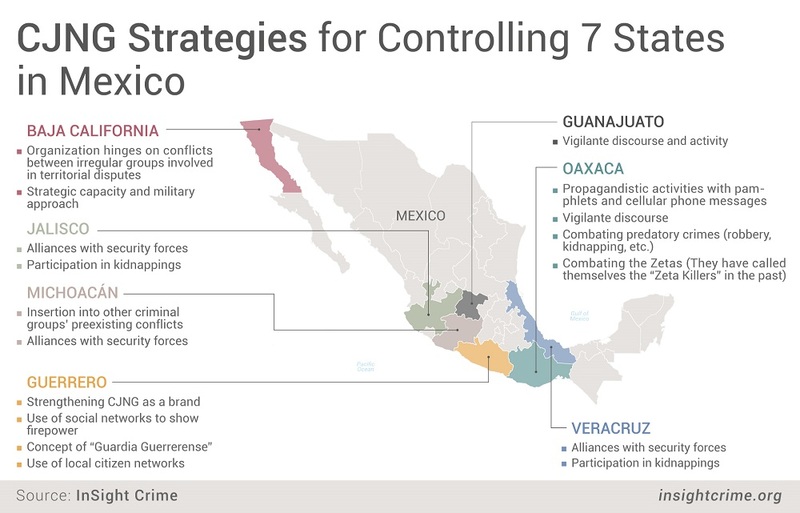 A look at some of the 20 states where the CJNG is believed to be present helps to understand how this criminal organization is consolidating and expanding. Towards the end of 2017, Mexico’s southern Oaxaca state came onto the CJNG’s radar. A video was recently released depicting a caravan of vehicles with the initials CJNG painted on the side and outfitted with heavily armed individuals entering the municipality of Loma Bonita in northern Oaxaca near bordering Veracruz state. In 2011, the so-called Matas Zetas (“Zeta Killers”) faction of the CJNG carried out one of its most important offensives in Veracruz. Propaganda is common for the CJNG, and the town of Loma Bonita is no exception. 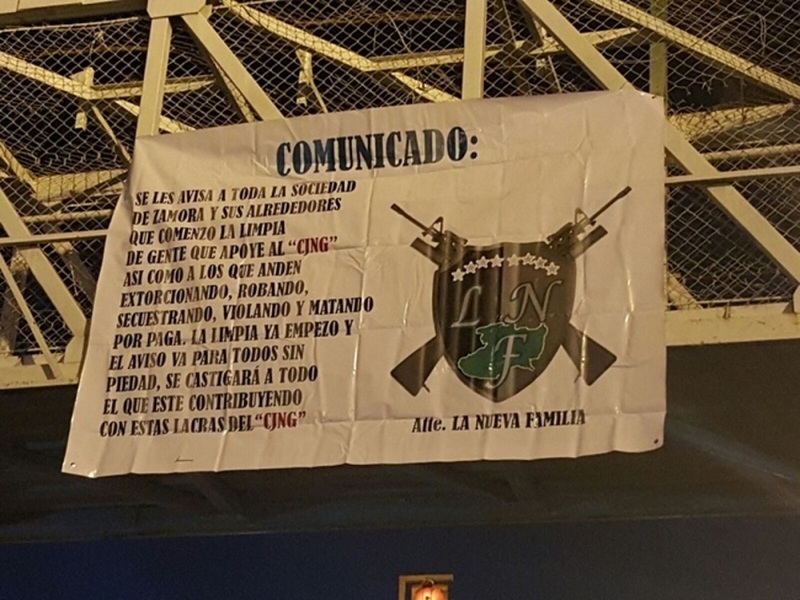 To complement the high-profile caravan, the CJNG distributed posters at key places, including the mayor’s office, and sent cell phone messages announcing its presence. These messages had a common tone — vigilantism. The CJNG arrived in ​​Oaxaca to impose order and ensure an end to predatory crimes, such as robbery, extortion and kidnapping. These claims alluded to the Zetas, rivals of the CJNG associated with these activities. Alleged representatives of the CJNG have even called local media to say that the group has nothing to do with kidnappings and extortion, according to local press reports. And despite the clear indications, Oaxaca’s Attorney General’s Office has not confirmed the presence of the CJNG in the state. This modus operandi is not new, as shown by one of the best documented CJNG campaigns, carried out in southwestern Guerrero state’s tourist city of Zihuatanejo. In 2013, Ezequiel Flores, a journalist who covered the events, explained that the CJNG’s videos and messages indicated plans for continued action. In this respect, the CJNG brand stands out as being synonymous with strength in the region. 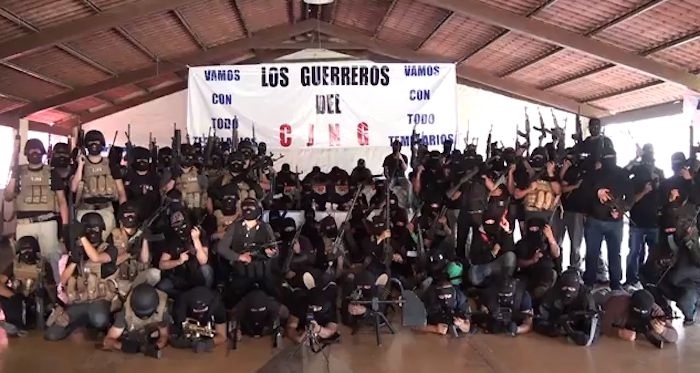 By 2017, the CJNG’s brand was clearly among the most powerful in the violent state of Guerrero, when the CJNG presented a local group called “Guardia Guerrerense” — limited only by its insolence in social networks. Flores explains that the CJNG did not enter Guerrero alone, but had the support of historical criminal leaders in the region, such as the Alba and Granados families. Understanding this dynamic in Guerrero helps to better understand the situation in Oaxaca. Thus, a caravan of vehicles and armed men walking freely is likely just the tip of the iceberg of the prior knowledge the group obtained in order to better understand the terrain and how best to deter citizens and authorities. This is only possible with the support of local networks. Although we do not know how much these alliances, which have traditionally been close with other criminal groups, have changed, it is possible that the CJNG has not only managed to acquire new local territory, but, with its psychological operations, has the means to conserve them. Other areas where the CJNG is present prove that the organization is able to insert itself into pre-existing conflicts and identify what it can bring to these existing organizations in order for them to benefit from the CJNG name and its resources. For example, with regard to the well-known self-defense crisis in Michoacán state, the CJNG linked up with civilians and rival groups, such as the Familia Michoacana, to isolate the Knights Templar, which at that time was perceived to be the most harmful local crime group. It was this historical knowledge of Michoacán — aided in part by the fact that leaders like El Mencho came from there — that allowed the CJNG to collaborate with federal security forces to capture or eliminate members of the Knights Templar. Some riskier variants of these insertions appear in pre-existing conflicts in Baja California’s border region, where the CJNG began assisting in confrontations, and later ended up being a catalyst for major conflicts. 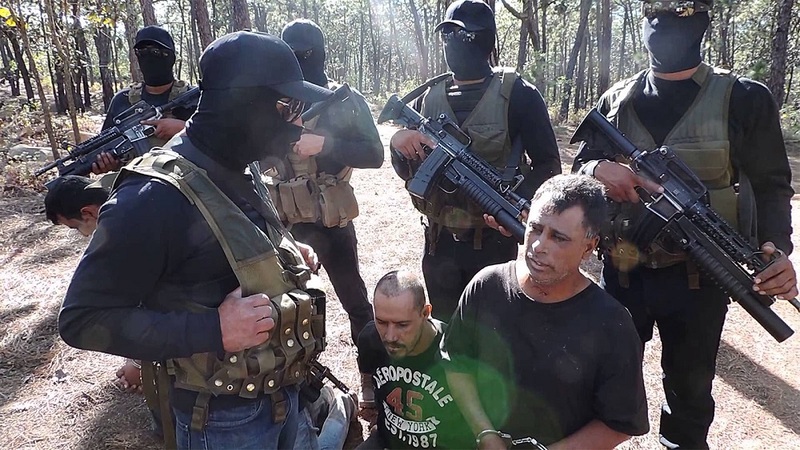 In Baja California, the CJNG took advantage of the remains of the Arellano Felix Cartel, also known as the Tijuana Cartel, to weaken the hegemony of the Sinaloa Cartel. This was evident in the sequence of clashes in places like the coastal city of Ensenada. This flexibility makes it possible for the CJNG to carry out similar operations in order to support groups in Baja California Sur, where there is a battle among factions of the Sinaloa Cartel, specifically between Dámaso López, alias “El Licenciado,” and the sons of Joaquín “El Chapo” Guzmán. These conflicts directly contributed to Baja California’s 426 percent spike in homicides between 2013 and 2017. This brings us to other conclusions. The CJNG exhibits a combination of a military perspective similar to that of the Zetas — summarized in its strategic capacity and in the propaganda-like nature of its actions — with the management of historical criminal networks from states such as Sinaloa, Jalisco and Michoacán, which the Zetas lacked. Mexico’s central Guanajuato state suddenly became the seventh most violent place in the country in the first half of 2017, recording 118 homicides per month. If one takes into account the number of crimes reported, it became the fourth most violent state. There are multiple causes for this, but it is well known that individuals linked to the CJNG are operating in that area to escape the pressure of the Operation Jalisco, a federal initiative targeting the group that started in 2015 after the downing of an army helicopter. With this context, and one month before the events in Oaxaca, the CJNG issued a statement. In the video, three CJNG members clearly, coherently and with vigilante rhetoric announced their arrival to Irapuato, Guanajuato’s second largest city, and one that is very different from the more rural city of Loma Bonita. The hooded men were escorted by 50 individuals with long weapons and camouflage suits. The message garnered a quick reply. Santa Rosa Cartel leader Juan Antonio Yépez, alias “El Marro,” known for his role as a “huachicolero,” or fuel thief, responded weeks later. But his response showed the difference between the two organizations. If the CJNG’s message offered a clear argumentative development delivered by a single intelligible voice, with the makings of an institutional comunique, El Marro’s video in response was much less elaborate. For example, the speaker’s voice was overpowered by the screams of other members of the organization, which sometimes made the message difficult to hear. In addition, the speech lacked the order the CJNG’s speech had. The open place from which it was broadcast gave an impression of spontaneity in contrast to the closed space where the CJNG video was recorded. The image that remains is that of a group that ensures “order” in a city experiencing an unexpected crisis of violence. The events in Oaxaca and Guanajuato had an amazing continuity in their neighboring state of Puebla. In November 2017, the CJNG used its relationship with fuel thieves in the region to venture into Puebla’s outskirts, where these allies would have taken refuge because of pressure from the military to contain the lucrative criminal activity. In Puebla, a much more high-profile city than the rural areas where it operated with fuel thieves, the CJNG attacked rivals, in a new, but now typical, proxy war. The above examples demonstrate the many fronts of the CJNG’s operations, new and old. To this we must add that some of the group’s members are in Jalisco, the group’s foreseeable logistical and financial hub. For example, in a confusing case, the former Sinaloa Cartel operator José Luis Gutiérrez Valencia, alias “Don Chelo” — who is also a blood relative of CJNG leader El Mencho — was allegedly killed in a confrontation in which a civilian and a marine also died just days after leaving prison. However, as media reports point out, when Don Chelo was released, the Marines were waiting for him outside the prison. In fact, Proceso reported that this high-ranking CJNG member had been delivered by a federal official to the Marines. The difficulty in clarifying the facts is undeniably related to the continued pressure federal forces are trying to put on the CJNG using any means necessary. These actions cannot hide the fact that the expansion of the CJNG to other places is a dynamic that the Mexican government must address. Military preparation, historical networks, strategic risks taken to reconfigure its brand and vigilante rhetoric — which is not inherent to the CJNG, but perfectly exploits its actions — are features that show an especially complex organization. This suggests a structural problem in which the CJNG’s alliance with some local security forces, which have participated in disappearances as emblematic as the case of Tierra Blanca, have a role in the violence. The government’s strong actions taken against the CJNG are designed to prevent this penetration of the state, which is much harder to reverse, and keep it from spreading to other parts of Mexico.